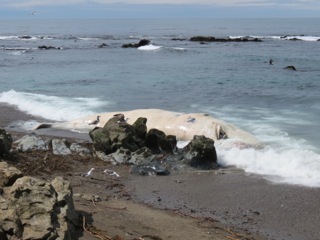 We picked up a local newspaper in the hotel in Cambria before we left as there was a picture of a dead whale that had been washed ashore. Despite the warnings in the paper that it smelt a bit, we drove the 2 miles up the coast to San Simeon to find it. It did smell a bit but I was amazed that despite this, and the Big One’s very sensitive nose, the girls both wanted to get as close as possible. It probably helped that we had to scramble over some rocks to get to the beach, as the girls love rock climbing! The whale was a 2 year old female and just over 9 metres long. We stood for a few minutes just watching the whale being buffeted by the surf before the smell became too much and the girls were keen to get away. It felt a bit sad leaving her and the girls were full of questions we couldn’t answer about why she had died and whether her Mummy was. Our next stop was to Piedras Blancas Elephant Seal Rookery where the female and young elephant seals were moulting. I’d never seen elephant seals up close before and there were hundreds of them! 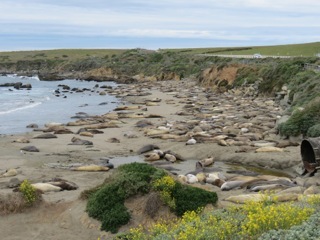 Lots and lots of elephant seals and this was only half of them! The seals were mainly sleeping on the beach with occasional movement and annoyance when one elephant seal climbed over another to get a prime position. The grown ups occasionally threw sand over themselves, presumably to exfoliate the old skin off. When they did so we could see the dexterity in their flippers – it looked just like a hand fused together, but you could see the individual fingers. It was quite amazing and we spent a long time watching the seals dozing and the younger seals play fighting and splashing around in the shallows. What an educational, if slightly smelly, morning. 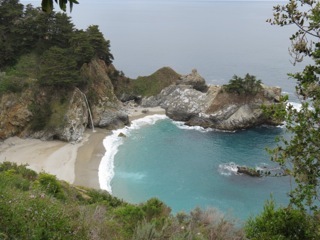 We continued our drive along the Big Sur coastline on Highway 1. This is renowned as one of the most beautiful drives in the world and it certainly provided some stunning views, even if the sun refused to come out very much. We stopped briefly at Jade Cove, a famous jade hunting beach and you can see lots of jade in the cliffs which you’re not allowed to take. We met some jade hunters in the parking lot above the beach and they showed us some jade they’d found by diving and also a fish which was blue inside that one of the divers had caught with his bare hands. Apparently it was one of the best local fish to eat but I’m not sure I’d eat a blue fish, even if the divers assured us that it went white when cooked. They also gave us several small jade stones so we knew what we were searching for. Good job too as when we clambered down towards the beach there was no way we could get to it with the girls – it was just too steep. You might be able to just see that there is a 25m waterfall which pours on to the beach. It looked like the sort of beach you could be marooned on, quite happily, for a few weeks. We arrived at Bernardus Lodge where we stayed for 2 nights and it was beautiful: 10 minutes drive up from the coast and up into the hills surrounded by vineyards, it’s a lovely hotel. First impressions are brilliant as we were given some chilled white wine within seconds of walking in through the door. Perfect! The girls were also given juice and there was a big bowl of fruit for them to nibble on too. The next day, Thursday, started out rainy so we headed off to the Monterey Bay Aquarium which has the third largest aquarium tank in the world. And it was enormous – it looked like you’d walked in and found yourself in the middle of the ocean! There were hundreds and hundreds of fish in there, some of them enormous. The fish you can see in the picture is a Sun Fish and it was over 1 metre long. There were sharks, huge tuna and shoals of smaller fish. 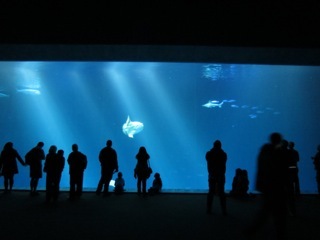 You could view the tank from 2 floors, which meant you got to see lots of different fish up close. Amazing. There were also lots of different tanks, huge and small, throughout the aquarium but our favourites were the jellyfish and seahorse displays where we spent lots of time being completely amazed. There were two jellyfish exhibitions and the second one we went in had a groovy 60s feel to it (see here: http://www.montereybayaquarium.org/efc/efc_jellies/exhibit.aspx ) which the girls loved as it was dark, with groovy music and colourful changing lights (a bit like being inside a lava lamp!) They spent more time dancing than watching the jellyfish. We headed back to the hotel, with a sleepy Little One and whilst the girls and I had more brownies in the bath (it was a shame to share them they were so nice, but the girls didn’t get any of my wine though…) my lovely husband went out to see the famous (according to him – I’d never heard of it…) race track, Laguna Secca which was only 10 minutes away. So, we were all happy. Especially the girls who couldn’t believe they were eating cake in the bath for a second day in a row and having a story read to them at the same time. It doesn’t get much better than that if you’re little! 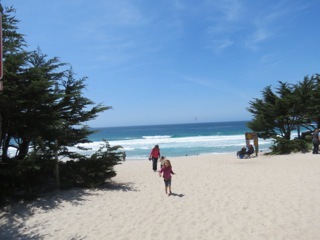 We drove the 17 mile drive through Pebble Beach and all the golf courses. The coast is beautiful there, with lots of crashing waves, perfect sand and rocks. We stopped for a play on the beach just by Pebble Links golf course. From the car it looked perfect, if a bit windy, with the sun out and white sand. In reality, it was so windy it was like being in Cornwall for February half term when the sun comes out and you dash to the beach really quickly only to find that it is still so cold and windy that 5 minutes is all you can stand! The coast here reminds us a lot of Cornwall and also Italy, which is probably why we feel so at home, those being some of our favourite places. 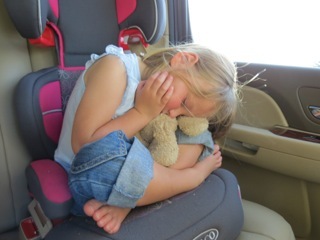 We all felt this tired! and didn’t even wake up when we got to the hotel, carried her inside, undressed her and popped her into bed. It was only 5.30pm! The Big One and my lovely husband headed out for the last mini adventure of the holiday – a trip to the beach and ice cream (and a banana) for dinner! Our first big adventure with the girls safely completed, we head back to Houston, already missing California.